Mount Damavand (also called Volcano Damavand) is in the central part of Alborz Range in north Iran near the Caspian Sea. Damavand height is 5671 m, 18605 ft above sea level. It’s the highest volcano in Asia, 1st highest peak in the Middle East and the 2nd highest volcano in the northern hemisphere. 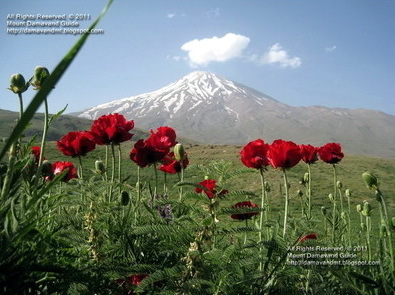 Snow covers Damavand mountain in the wintertime and the upper parts in other seasons. Its wintry white peak with it is regular clouds is the most beautiful sight of Iran. Snow covers the whole mountain in winter and the upper parts in alternate seasons. Damavand (in Persian دماوند) has a small summit crater generally with snow-top and cloud. The white top with its consistent lenticular Cap Cloud is the most lovely sight of country. Damavand is encompassed by numerous gorgeous pinnacles of the Alborz Chain. The perspective of this gigantic mountain looks more alluring from away than closeup. In a crisp morning it is visible from a long way, about 250 km away. Mt Damavand is the most distinguished character of Iran approaching grandly close to the southern shore of the Caspian Sea. It has a small summit crater with perpetual snow top which encompassed by numerous gorgeous pinnacles of the Alborz Mountain. Damavand is noticeable a long way from 250 km in a reasonable sky. Just underneath its crater there are couple of well known glaciers, icy masses, for example, Yakhar, Sioleh and Dobi Sel. Damawand is situated around 70 km north east of mega city Tehran, halfway the Haraz Road close to the Amol city in Mazandaran Province, Iran. Due to its extraordinary tallness, the view from top is extremely broad, a major scene of mountains and valley covering numerous hundred of square Kilometers. Around the mountain are different pinnacles of the Alborz Range, in the north to the Caspian Sea plain and in the south to the deserts of Iran. It is the most noteworthy pinnacle of Iran and Middle East and the most astounding in the event that you make a trip from Europe eastbound to Iran. Damawand is a notable image of Iran and has an incredible place in Iranian legend, legendary stories, craftsmanship and photography. In all actuality it is a brilliant lethargic spring of gushing lava that conveys some sulfuric smoke. Numerous myths and stories are identified with Damawand Iran. The most punctual try to climb Damavand was made by unknown local Iranians. They climbed routinely to gather sulfur from the summit for business purposes. The primary recorded climb was made by an English pilgrim called W Taylor Thomson in 1837. Information for trekking tour Iran. Climbing tour and ski touring to Iran mountains. Mount Damavand summer Expedition 2019. Climbing tour operator to Alborz. Zagros mountain ranges tours 2020. Rock and boulder climbing guides. Contact Mt Damavand Info for information. Iran trekking & climbing tours. Ski tour for Iran mountains. Info for hiking trekking and climbing tours. Best season for climbing tours to Mt Damavand. Ski tour Alborz and Zagros Mountains.